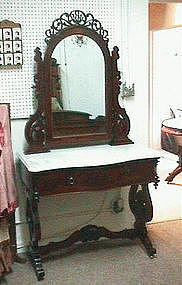 Beautiful flame mahogany dressing table with marble top, all in excellent original condition. 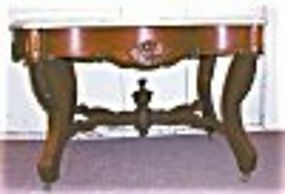 This lovely table is transitional from Empire to Victorian, circa 1870. 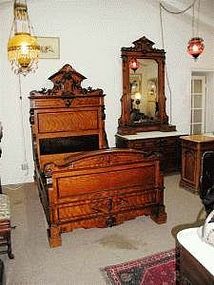 It has a shell stretcher, and perfectly matched flame mahogany drawers. It measures approximately 73 1/2" tall x 39 1/2" wide x 23" deep. 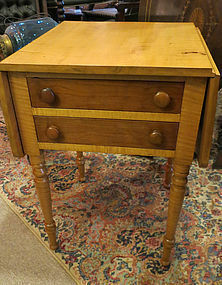 Lovely early 19th century two drawer drop leaf worktable, tiger maple with cherry drawers. The drawers are all chamfered on the bottom, and the piece measures 29" tall x 20" wide x 20 1/2" deep, and 39 1/2" wide when the leaves are up. 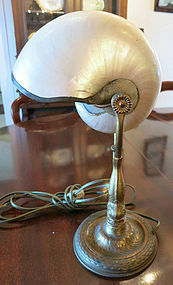 It is in wonderful original condition. 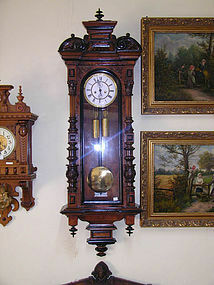 Beautiful Victorian two-weight wall clock of burled walnut trimmed in black. 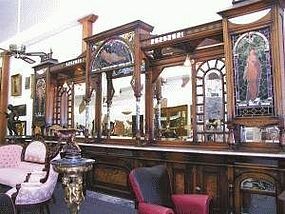 Has second hand, and chimes on hour and half hour. This lovely clock measures 17 1/2" wide x 53" tall and is in perfect working condition. 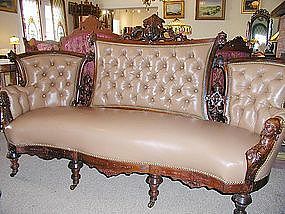 Gorgeous walnut sofa by John Jelliff with man's heads on each arm and woman's head on top; circa 1860's; newly upholstered in the softest and most beautiful tufted leather. Measures 80" long x 44 1/2" high x 23 1/2" deep. Condition is perfect. 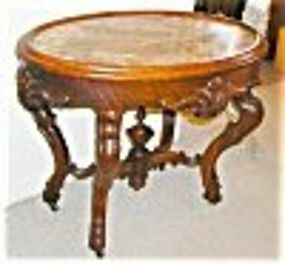 As is all coffee tables of this type, this lovely marble turtle top table has been cut down to make coffee table height. 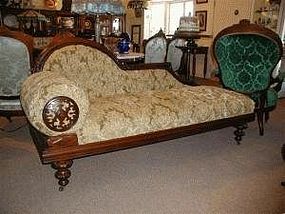 It measures 21" tall x 36" wide x 26" deep and is in lovely condition. 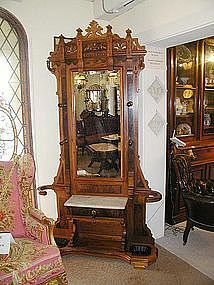 Beautiful American Victorian hall tree, circa 1880, measuring 47" wide x 87" tall x 12 1/2" deep. Marble top over center drawer; original pans on bottom; beveled mirror. Walnut and burl woods, all in excellent condition. 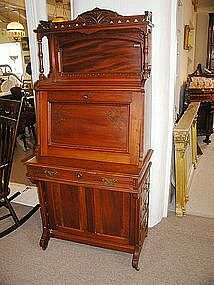 Very lovely and unusual tall slant front desk, opening in the front, but having drawers on one side like a davenport desk, and a door on the opposite side. 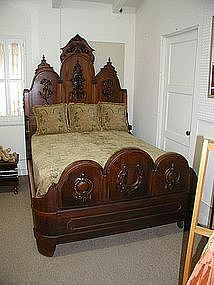 Measures 67" tall x 30" wide x 18" deep; circa 1880; in lovely condition. Very unusual American victorian check of walnut and burl. 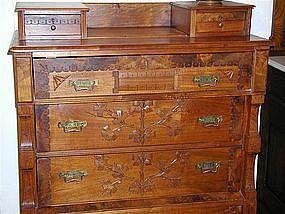 It has two small drawers on top and four large drawers on the bottom. The design is one of flowers, and is framed with a burl border. Circa 1880, very different. Beautiful early cherry two piece corner cabinet with the top door having 12 panes of original glass (one pane has a very tiny crack at the bottom of it). 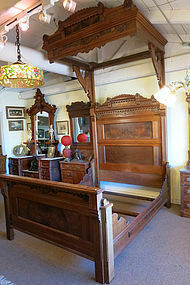 It is all mortise and tenon construction, and measures 88" tall 43" wide x 27" deep. Other than the one small crack in the glass it is in perfect condition and ready to go into your home. 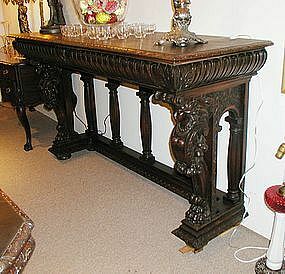 Beautifully carved solid mahogany server by R.J. Horner, New York measuring 72" long x 24" deep x 39" high. The front legs have carved women with garlands of flowers. There are 2 spring loaded drawers in the front. 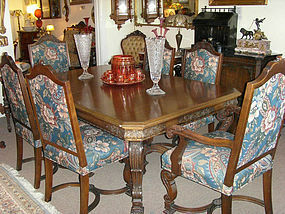 This great piece of furniture is in wonderful condition and will fit beautifully in a dining room or hallway.